For her new album Renee Fleming has ventured into relatively new territory, a disc of arias from verismo operas. In operatic terms, verismo is slightly nebulous. It was in fact an Italian literary movement which in the late 19th and early 20th century brought realism into their writing. The verismo operatic school is associated with Mascagni, Leoncavallo and Puccini. The prime exponents being Mascagni's Cavalleria Rusticana and Leoncavallo's I Pagliacci. The subject matter dealt with contemporary everyday subjects. The term has come to refer the Italian post-Verdian school of operatic writing and does not really distinguish between the operas which come close to the verismo manifesto and those, like Mascagni's Iris, whose subject matter is far from everyday. The other aspect of verismo operas is the tendency for the musical material to be continuous, so that arias are fewer and shorter. On this disc Fleming has bravely chosen a wide repertoire of lesser known pieces. Where operas do have well known numbers, like Catalani's La Wally and Cilea's Gloria, she has chosen to sing other pieces from the operas. The only really well known arias in the recital are those by Puccini. She opens with Senza Mamma from Suor Angelica. This reflects another vein which runs through the verismo operas, a strong vein of sentimentality. My first reaction to hearing Fleming singing this repertoire was that she is highly interventionist, each note is individually shaped, pushed and shoved, whilst keeping a sense of line. It surprised me how well this worked. Her upper registers is still free and lovely, something rather necessary in Suor Angelica. She is expressive and her diction is good. Iris is Mascagni's Japanese opera and in Un di Iris narrates how one day at the temple a priest told her pleasure and death were one! Fleming is attractively urgent here and builds to a good climax. Puccini's La Rondine is hardly unknown nowadays, though it is less highly regarded than his other works. It is also far from the verismo canon. But in Ore dolci e divine Fleming shows that Magda suits her voice well. Here though, I did think there was some strain on the top. Also, I began to be rather too conscious of the artfulness that went in to the performance. Flammen, Perdonami from Mascagni's Lodoletta involves the heroine dying in a snow-storm even though the hero is outside as will and seems to be unaffected. Here Fleming is expressive and dramatic, though the tone does get a little squeezed at the top. Ne mai dunquie avro pace is, rather admirably, NOT the well known aria from Catalani's La Wally, the opera with the rather butch Swiss heroine who saves the hero at one point. By this time I was starting to find Fleming's generous vibrato rather intrusive and a little all to encompassing. Si, mi chiamano Mimi from Puccini's La Boheme and Donde lieta usci are probably best considered as contrast for the two excerpts from Leoncavallo's La Boheme. In the Puccini arias, Fleming's Mimi is a little too artful and mannered, you are conscious of the swooping voice and breathless tone, but she is affecting nonetheless. She spins a lovely line but never quite tugs the heart strings. Musette svaria sulla bocca viva and Mimi Pinson, la biondinetta are two charming numbers from Leoncavallo's La Boheme. As anyone who saw the ENO production of the opera, this work is not inconsiderable. But here its weaknesses show, the music is lovely and charming, but tells you far less about the character than Puccini's does. In the longest track on the opera, Angioletto, il tuo nome from Leoncavallo's Zaza shows Leoncavallo experimenting with textures. 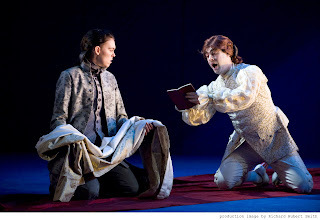 The libretto is about a French music-hall singer who leaves her lover because he is married. In this excerpt Zaza sings a big romantic number in dialogue with the child, Toto, who speaks over instrumental accompaniment. Part of the way through Leoncavallo introduces a paino and later a solo cello, thus providing an array of interesting textures and colours. Perhaps because the excerpt is rather longer, Fleming seemed to bring to this the passionate intensity which is missing in the other tracks. In Sola perduta abbandonata from Puccini's Manon Lescaut Fleming does give us chest tones and strong emoting, but I rather missed the darker vocal colours which other singers have brought to this role. Taken on her own terms, however, this was lovely, the climaxes wonderful and she gives us the original manuscript version of the aria, evidently its first outing on disc. Zandonai's Conchita set a libretto (based on Pierre Louys) which was rejected by Puccini. Ier della fabbrica a Triana is very much a character number, which seemed to want a tighter less voluptuous voice. Cilea's Gloria is a rather Romeo and Juliet-ish story set in Sienna and in O mia cuna, fiorita di sogni e di melodi Fleming is convincingly impassioned. Giordano's Fedora does have a flickering half-life in the theatre, though Troppo tardi! Tutto tramonta, tutto dilegua is not one if its best known numbers. Giordano provides melodic material in plenty but the piece never seems to settle into the big number that it seems to want to be. Here Fleming is wonderfully passionate and intense. With Tu che di gel sei from Turandot we are back on familiar ground. Here there is just too much artfulness and not enough directness in Fleming's performance. It is admirable and impressive but we are a little too aware of the way the voice has to be controlled. I would hardly imagine this role would be core repertoire for the singer nowadays. Nel suo amore rianimata from Giordano's Siberia is very short and rather charming. Finally the set finishes off with Fleming being joined by Jonas Kauffmann for Bevo al tuo fresco from La Rondine I don't know whether I'd want the complete recording but it is delightful. In all the arias Fleming is well supported by Marco Armiliato and the Orchestra Sinfonica di Milano Giuseppe Verdi. On this set Fleming shows that her art is about much more than luxuriating in a beautiful voice. Many of these arias need more than just a lovely line, and by and large this is what Fleming gives is. Frankly, she lacks the chest register and the simple, direct gutsy singing that are best in some of these pieces. If I had to choose a single singer than I would prefer someone like Renata Tebaldi. But Fleming shows that she can bring something to the pieces. But in her choice of aria and in her performance, Fleming is refreshingly different and brings something new and interesting. Recommended. My review of Sunday's performance of Handel's Susanna from William Christie and Les Arts Florissants is here on Music and Vision. My review of ETO's production of Alcina is now on-line here, at Music and Vision. I must confess that I when I saw the full ballet, I had doubts about McCabe's score for David Bintley's ballet Edward II, finding the music too complex and symphonic for the dance especially as Bintley was creating a grand historical ballet in the traditional manner. In 1999, shortly after the first performance, McCabe re-worked the music into his symphony, though in fact the name symphonic suite would be better. The result is 45 minutes of extremely powerful music and it is puzzling why the work had to wait till now for its first public performance. Salomon's account of the work was compelling and dramatic. Granted there was the odd rough corner, but these counted for little against a fine performance of such a taut work. Ellis's concert scenario from Romeo and Juliet uses the composer's final ballet score as its source and keeps the episodes in the correct order which means that the plot can be followed in the music. The composer's own suites were assembled after the music was first written and preserve the original orchestration in places, but Prokofiev re-ordered the scenes for musical effect. The concert scenario lasted just over an hour, which made for quite a substantial concert. I got the impression that the orchestra might have been tiring a little. The louder, more dramatic movements worked best. Though there were some lovely luminous moments in the quieter passages, the effect was not quite as concentrated as perhaps it could be and one was aware a little of the difficulty of Prokofiev's score. The concert scenario worked well dramatically and there were only a couple of moments when I felt rather a lurch in the music. But then again, I have become most familiar with the score as a ballet score at the Royal Ballet where I first saw it nearly 40 years ago in a performance with Natalia Makarova (newly defected from Russia) and the late David Blair. In fact it was the first live ballet that I had seen, a wonderful introduction. The piece was performed with projected excerpts from Shakespeare's play along with images from Kenneth MacMillan's ballet, useful if you were unfamiliar with the ballet. As ever, Salomon delivered a memorable concert with some powerful playing of some strong music. Two of my Choruses from Passion (It was for love and If this were your final day on earth received their Polish premieres on 12th September 2009 at a concert at the Cathedral of Christ the King, Katowice. The concert was given by the choir Mieszany Caecilianum directed by Jan Kaleta. A less alternative view, but one that remains relatively unexplored, is the relationship between Kurwenal and Tristan in Tristan and Isolde. Generally Kurwenal is portrayed as the older retainer type, movingly devoted to his master. This is probably what Wagner wanted, but if you make him rather younger you can explore different views, including the one that Kurwenal is in love with Tristan (unrequited of course). I have seen one version of the opera, many years ago, where a younger Kurwenal brought this out a little without distorting the plot. Its something I'd like to see explored further, but opera productions in general seem to shy away from this sort of exploration. How did he do it. A recent copy of Country Life (which hit our letter box rather late owing to the Postal strike), included an article on demolished London buildings which had been photographed for the magazine. This included a fascinating photo of the chapel of the Foundling Hospital taken from the west end gallery and looking down towards the altar. (The above illustration is the reverse view). The area round the altar (sides and back) is entirely taken up with box pews. Which leads on to the fascinating conclusion, where on earth did Handel put his orchestra and singers when he performed Messiah in the Hospital chapel? As anyone knows who has been to one of the London Handel Festival performances at St. George's Church, Hannover Square, fitting a chorus, orchestra and soloists for a Handel oratorio into a church is no easy business. By the look of the Foundling Hospital, there is even less space round the altar. So, did Handel dispose of his musicians in an around the box pews? Or did he put them in the gallery with the organ? This latter fitted in with Georgian church music tradition where the west gallery was the place where the choristers and instrumentalists played. But it would have meant that Handel and his musicians were sitting behind the audience, and a gallery is hardly the best space in which to fit the cast of Messiah. But given that the organ was in the gallery, this seems the most likely place. In Handel's Flavio the role of Vitige was written for a female soprano (though the role is usually sung by a mezzo nowadays). This means that Vitige has a higher voice then his lover, Teodata. As part of the plot, it is necessary for Vitige to be embarassed about his association with Teodata and not to tell Flavio about it when Flavio expresses interest in Teodata. Now Handel wrote a relatively small number of soprano male roles, partly because he didn't work with many soprano castrati. Quite often, I find it difficult to appreciate sopranos in these roles because they seem to fail to have the requisite knack of androgyny, so that the come over as feminine; not just physically but vocally. I must add here that Angelica Voje in the recent ETO Flavio was entirely admirable. But this led me to wonder why, with the penchant nowadays for cross dressing, no-one has turned one of the soprano heros into a woman. In the case of Flavio this would work moderately well, it would help explain Vitige's lack of response when Flavio talks about Teodata. A careful reading of ENO's new Opera Guide for Feb to July 2010 makes for interesting reading. The Elixir of Love comes from New York City Opera (along with the leading man John Tessier). But the sets were originally constructed by the Royal Swedish Opera, which seems to imply that we are getting this show third hand. One question that occurs to me, have these other companies parted with the production because they have found it unsatisfactory in some way once first produced (i.e. its not really desirable to revive it). Or will ENO have to compete with them for sets if they want to revive it. And Katya Kabanova is described as a co-production with Teatro Nacional de Sao Carlos, Lisbon and Teatr Wielki-Opera Narodowa, Warsaw. But the costumes were built (sic) by The Dallas Opera Costume Workshop and the pictures of the production come from performances by the Houston Grand Opera. Again this looks like a much travelled production which surely has an impact on scheduling, especially if the production does as well as the recent Jenufa. my review of From the Vaults of Westminster Cathedral, polyphony and chant sung by Westminster Cathedral Choir, is here, on MusicWeb International. The Sunday matinee bug hit Covent Garden again on Sunday when Ben Heppner was taken ill with a viral infection. Lars Cleveman had sung the role from the wings on 15th October and on Sunday he took over properly. Cleveman, a member of the Royal Swedish Opera, had previously sung the role of Tristan with Nina Stemme as Isolde in another staging, so that they had this to build on. Even so, taking on the role in a brand new staging was something of an undertaken, bravely done. Any staging of Tristan und Isolde by Christoph Loy was bound to have a cerebral element. In this case, the stage was divided into two; the front was a plain 'existential area' in which the main action took place. The rear, hidden by a curtain, was a more naturalistic representation of King Marke's court. The setting was modern day and all the men work evening wear, though Tristan had a black shirt. Isolde started in her wedding gown and then moved to a black dress. Brangane (Sophie Koch) had a red, bob wig and a short, stylish grey dress; she looked bizarrely like Anna Wintour which could hardly be the intention. I rather liked the idea of the existential area. The opera opened with Nina Stemme wandering through the remains of her wedding party one the rear stage before entering the front stage. The way that the action of Act 1 was intercut with excerpts from the wedding party, so that when the ships sailors sang we actually saw the guests at the wedding on the back stage. Cast members came and went from the Wedding to the main Act 1 action. It sounds confusing to describe, but the result worked well and gave the feeling that the whole of Act 1 was playing in Isolde's mind at the wedding as she tried to come to terms with how she got to where she was. All this would have worked wonderfully, but the front stage was simply far too lacking in design interest. The walls were grey and the only props were a table and two chairs of a type that could have appeared in any rehearsal room, in fact the front area looked just like a rehearsal studio. When the curtain between front and back was closed, we could only look at the singers in their boring evening wear, no style, no design interest, nothing. This was fatal and meant that the whole production took on a rather cerebral air. It certainly did not help that Tristan and Isolde looked like a middle aged couple from Frankfurt rather than the protagonists of one of the most romantic operas around. Much of the action in the 'rehearsal studio' took place against the left hand wall which added to the problems, as a large chunk of the opera house could not see it properly. During act 2, the curtain to the back area opened occasionally, to reveal the wider world around Tristan and Isolde's love and then during the love duet, Isolde draws back the curtain to reveal the courtiers observing them. Finally in act 3 the rear stage revealed not the reality, but a different conceptual space representing Isolde. In keeping with the general concept, Antonio Pappano's conducting kept the orchestra rather quieter than usual, which helped the voices; but though beautifully moulded, you were never blown away. Similarly Nina Stemme's Isolde is one of the most beautifully sung versions of the role that I have ever heard. She has developed a wonderful gleaming top, but her instrument does not easily dominate the orchestra. She was passionate and impassioned. But the performance seemed slightly at one remove; a feeling that was generated by the distance inherent in the performance. Perhaps I am being a little unfair, but the performance impressed me without overwhelming me. Regarding Cleveman's Tristan, we should allow him some leeway. It must be admitted that he is slight and short of stature, in complete contrast to virtually all the other Tristans I have heard who have generally been bear like men. His voice in the first half of act 1 seemed small and carefully managed, but he let go during the closing pages. This was repeated in act 2 when he really only seemed to let go during the closing pages of the love duet. His was a neatly sung and well shaped account of the role, his voice does not have excessive wobble which means that he sang with a fine sense of line. But I was constantly aware of the care he was taking and the husbanding of his resources. That said, he got to the end of Act 3 without ever seeming to be overpowered by the role, which means that he has got the measure of his voice. His is a Tristan I would like to see again in less fraught circumstances. His previous relationship with Nina Stemme helped, so that the two of them did develop the sort of rapport necessary. Michael Volle was a fine, rich voiced Kurwenal. He was allowed some intimate moments with Sophie Koch's Brangane in Act 2. And was profoundly moving in his contributions in Act 3. Sophie Koch turned a beautifully sung and passionate account her role. Matti Salminen was far more involving as King Marke than I could ever have anticipated. King Marke's monologue at the end of Act 2 has always been a stumbling block for me, few singers seem to be able to bring it off. But Salminen almost had me convinced. Pappano and the Royal Opera House orchestra were in fine form. As I have said, Pappano seems to have kept the orchestra under quite a tight rein. Not since the days of Bernard Haitink have I heard such a singer considerate accompaniment. I will go back to this Tristan if it reappears in the schedules, especially if Lars Cleveman is given a proper go at the role. My review of ETO's Tolomeo is here on Music and Vision. My review of ETO's Flavia is now on-line here along with some very striking pictures. My review of the disc of Penderecki's unaccompanied choral music is here, on MusicWeb International. So Opera North is to develop their very own Ring cycle. Though they are doing it with a bit of care, the operas will be performed in concert following on from their previous successes doing such works as Salome and Elektra in concert. Frankly, I've always been a bit puzzled by the suicidal desire of opera companies to perform the Ring cycle. The costs are immense, not just the size of the cast required but the length of the operas means that overall costs tend to magnify as well. There is also the problem of casting. ENO tried to get round this by developing their cycle gradually, doing the works in concert first. But though this seemed an admirably democratic exercise, there was something frankly a little embarrassing singers and conductor getting to know their parts in so public a fashion. Opera North have always done marvels on a shoe string, though sometimes they have been unable to persuade things to stretch quite far enough. So that when they did The Trojans, the two parts of the work were performed separately and never together. Something similar seems to be happening with the Ring as they are scheduling the 4 operas from the Ring in successive years from 2011 to 2014. The Press Release is delightfully vague about whether we are getting a full cycle. Also, do we want to hear the Ring done in concert? When the Royal Opera did their semi-staged version of the Ring at the Albert Hall, the principal joy was hearing the experienced singers who could take command of their roles whatever the setting. In Die Walküre it was wonderful to hear and see John Tomlinson and Hildegard Behrens playing off each other whenever they were on-stage. But in Act 1, Kim Begley and Rita Cullis were a little too new to their roles to bring very much extra to the performance and it proved rather disappointing. Given that they are doing the Ring, Opera North's plan to do it in concert and to search for new singers to fulfil the roles, seems entirely admirable. But it is fraught with difficulties. On the other hand, my view is rather London centric. The only way for opera lovers in the North of England to hear the Ring is if someone like Opera North does it. So perhaps we should applaud after all. My review of Saturday's performance of Dido and Aeneas by Les Arts Florissants is here on Music and Vision. Tonight is the premiere of my motet Thou, O Christ, which sets words by St. Symeon the New Theologian. The work is being performed during Evensong at St. Botolph without Bishopgate, London where the choir will be conducted by Timothy Storey. To the Barbican yesterday to see Les Arts Florissants perform Dido and Aeneas in the Barbican Hall. The performance was based on a staged version, but we saw a reduced but no less impressive version with no sets and a simplified lighting plot. I was lucky enough to attend the rehearsal before hand, where it was fascinating watching Christie and his performers fitting the performance to the new space. All were impressive both in rehearsal and in performance. It is always amazing to watch the transformation that comes over a cast between rehearsal and performance, the magic of live theatre. For musical director who seems to keep to a minimum what he does in a performance, Christie proved to be highly articulate and keenly aware of all the details which he required, from orchestral articulation through to lighting and the pronunciation of awkward English vowels. My full review of the performance will appear in the next few days. Off to see Les Arts Florissants doing Dido tonight and getting in to the dress rehearsal this afternoon. So expect further reports. Some time ago I reviewed a fascinating disc which reconstructed the sort of music which was used by the Jesuit Mission in 18th century Peking. This involved fairly traditional 18th French settings of the ordinary of the mass, along with motets and psalms which used Chinese translations for the words and Chinese traditional music. Now you can hear for yourself, in the Oriental splendour of the music room of the Brighton Pavilion. Because on Nov 7th La Baroque Nomade, director Jean-Christophe Frisch, along with some Chinese musicians, will be presenting an evening of music resulting from the contacts between the Jesuits and the Chinese in 17th and 18th century Peking. Off to the Barbican on Saturday to see Dido and Aeneas performed by Les Arts Florissants as part of their 30th birthday celebrations. We can expect William Christie to bring out the French influences in Purcell's music, but I will be interested to hear how the cast handle things. Especially given that the Dido, Malena Ernman, is Swedish , the Aeneas, Luca Pisaroni, is Italian and the Sorceress, Judith van Wanroij is Dutch. Still, I should not be chauvinistic there was some superb diction at the ENO's Le Grand Macabre and not all of it came from Anglophone singers. I'm getting to go to the dress rehearsal of Dido as well as the performance which should certainly be illuminating; will report back. The enterprising New Sussex Opera are giving the UK premiere of Offenbach's opera Die Rheinnixen. This was a grand, romantic opera which Offenbach wrote for Vienna. After the premiere in 1864, when it was performed in truncated form, Offenbach withdrew it and re-used some of the music in The Tales of Hoffmann. The opera received its premiere in its original form in 2002. Besides being his first grand opera, the piece is his only operatic setting of a German text. It sounds quite a big piece, with well over 3 hours of music and Offenbach seems to occupy the musical realms of Weber. It is an important pre-cursor to Hoffmann and we must be grateful to conductor Nicholas Jenkins for giving us the opportunity to hear it. There are performances at Lewes town hall on 21st October, Eastbourne Winter Gardens on 25th October and Cadogan Hall, London, on 27th October. My review of a disc of Moniuszko Masses is here, on MusicWeb International. My review of Rigoletto from Grange Park Opera is here, on Music and Vision. I am now over 60 minutes through and am steadily working my way down the penultimate page of the libretto. The piece is based on a play by Alan Richardson called When a man knows which has a distinguished performance history, so I hope the opera lives up to it. Just to give you an idea of the differences between opera and the stage, the play is estimated to last 35 minutes whereas the opera will last around 70 minutes, despite having the text trimmed down to the bone. This still leaves me with the worry that the baritone part might be too long. I think that I need to be more radical in my use of the chorus to provide a pause in the long dialogue between the man and the woman. The problem with this is that it means I need some new text, so I will have to think about it. Having got this far with the piece I have started to think about performance and will start making plans to have a workshop/concert performance in the spring of next year. Review of Ligeti's "Le Grand Macabre"
I first saw Ligeti's opera Le Grand Macabre when ENO first performed it in the 1980's in a rather 'po faced' production by Elijah Moshinsky which seemed to be set in and around the Hammersmith Flyover. Now the opera is back, in a new production by the Catalan group La Fura del Baus. Since the 1982 Coliseum performance Ligeti has made revisions to the piece, dropping much of the spoken text and setting the remainder to music, thinning and simplifying the orchestration. Though there are still spoken moments, the result is that the piece is more thorough-going operatic than it was. The concept of La Fura del Baus production was that the entire action took place in and around the huge body of a woman, with the cast make entrances and exits through her orifices. During the prelude, played on car horns, we saw a film of the woman apparently eating herself to death. The huge model was manipulated around the stage in fantastic manner and the use of projection was quite stunning, so that the body could be transformed in a moment from a skeleton to a writhing mass of burning people. As a piece of theatre the result was stunning and made for a gripping 2 hours in the theatre. But Ligeti evidently had a very precise view of how the opera should look and had dislike most of the productions that he saw during his lifetime. It is a moot point whether he would have liked this one. I could not help feeling that setting the action in a more realistic setting would have helped emphasise the surreal nature of the plot, whereas putting a surreal play into a setting which is equally mad, seemed to de-nature it somewhat. Watching the production, I could not help thinking of Joe Orton's early novel, Head to Toe which all takes place in and around the body of a giant woman, and wondered whether the Catalan directors had read it too. The cast were impressive. Wolfgang Ablinger-Sperrhacke delivered a tour-de-force performance as Piet the Pot, with impressive English diction, it must be one of the few roles where the tenor's stomach has to make a starring role. Pavlo Hunka (UK born despite his name) was Nekrotzar and was impressive but perhaps just a little too personable and lacked the feeling that he was capable of random violence. Frances Bourne and Rebecca Bottone were the lovers, Amando and Amanda, dressed in what appeared to be flayed flesh. Norwegian Frode Olsen (also with impressive diction) was Astradamors, bravely spending the entire evening wearing a pink camisole. Susan Bickley had a whale of a time as his wife Mescalina. Susan Andersson was truly impressive in the two spectacular coloratura roles, Venus and Gepopo the chief of Secret Police. Daniel Norman and Simon Butteriss formed a neat double act the the two ministers, with Butteriss got up Black and White minstrel fashion as the Black minister. Andrew Watts was Prince Gepopo, proving that the role works well if sung by the right counter-tenor (Ligeti preferred a woman or a boy). The whole was beautifully orchestrated by conductor Baldur Bronnimann. The end result was a delightful night in the theatre, but it still left me thinking what is it for? Ligeti intended his piece as a sort of anti-opera, or perhaps and anti-anti-opera and took part of his inspiration from the Venetian baroque where the operas consisted of a stream of often barely related scenes. It is over 25 years since I saw the work and I'm afraid that the new ENO production did not convince me that there was any reason why I shouldn't wait another 25 years before seeing it again. Ludovico Einaudi trained in composition at the Milan conservatory and studied with Luciano Berio. Since then his compositional style has moved somewhat; he composes music which mixes ambient, minimalism and contemporary pop. His new album, Nightbook, is based around his own piano playing though the disc also features the cello playing of Marco Decimo and the viola of Antonio Leofreddi. I previewed a copy of the album, reviewing 5 tracks on download from Decca (Lady Labyrinth, Nightbook, Indaco, Eros, Reverie). Though his music is billed as being ambient and meditative, there is something rather strongly dynamic about the music on these tracks. Though he uses the techniques of minimalism, so that the musical figures are repetitive and the musical argument often circular, they are combined with a muscularity of utterance which belies the ambient background. Lady Labyrinth is quite piano heavy, being both rhythmic and dramatic, though drifting away towards the end. Nightbook starts in the same vein but has a gentler middle section and Indaco features the cello developing a melody. Eros is, rather surprisingly given the title, rather more nagging and buzzing, building to a strong climax and finally Reverie is a gentle piece with a long held cello line. Though Einaudi's music, as heard here, is hypnotic there is something rather dramatic here which veers away from pure ambient; at times he reminded me of Keith Jarrett in more meditative mode.